Aluminum profile is a unique versatile material, suitable for use in many industries. The wide distribution of aluminum profile due to the fact that it has a lot of advantages and almost no disadvantages. It is used in construction, architecture, have a profile and electrical machinery, universal. Construction and architectural aluminum profile made from alloys brands AD31, AD35, AD33. This profile is used to create fronts and barriers, it is used for making doors and Windows, you can use this profile and in the interior works. Brand D1, A2, A5, A6, 1915, 1560 and analogues is the transport of aluminum profile used in the automotive, shipbuilding, aircraft construction. This type of profile is used for the production of elevators – passenger and freight. 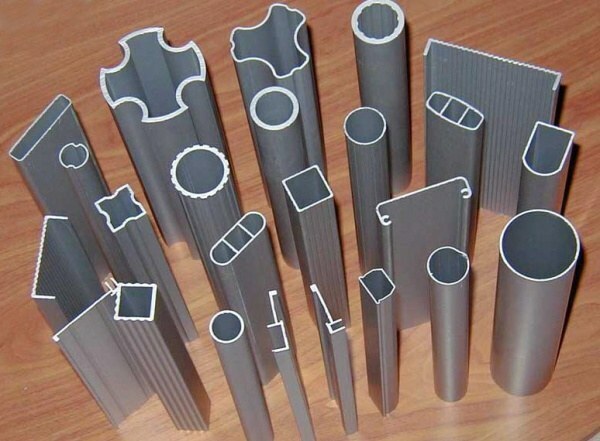 Aluminum profiles brands AD0, AD1, AD31 are used for the manufacture of heat exchangers, with the creation of air conditioners, heaters, refrigeration equipment. This electrical aluminum profile, he also used to produce aluminum busbars. Universal profile, aluminium is a material used for making channels, angles. Use it in the production of sports equipment, and some consumer goods. In fact, the entire profile is made by extrusion, however, the manufacturers are divided into 2 large groups, those who have own foundry, and those who work with blanks. First first produced in the stationary, and then turning the furnace (mixer) metal ingots in 178 millimeters. The production itself is that the composition of the primary material can be changed according to customer's requirement, and therefore, the final product will have the desired properties. - the type of processing the material (aged and seasoned, with no heat treatment profile). Aluminum profile is aesthetically pleasing, so use it even as a design element, for example, in the interiors in the style of hi-Tech. The factories, equipped with press equipment, work with bars or webs of the metal. Usually working pressure - 250 barrels, this power allows to obtain the products corresponding to GOST. Original source material cut with a special saw and heated in low oven, warm the metal goes into a press where it is made the procurement of the future profile. The workpiece is polariscopy treatment – perforation, masturbirovala, anodizing (system create a protective film, preventing the oxidation processes), applied technology, color profiles. The maximum possible length of the diameter profile today of 225 millimeters and a wall thickness of 0.8 mm. Thanks to the flexibility of the material and technological lines, profiles can be produced according to individual orders, and this often requires restructuring of the production line. Aluminum profile can be made almost any size under the Russian GOST, and thickness, and the height (length). He is also appreciated for the fact that this material is lightweight and plastic, but durable and reliable. Aluminium does not corrode if its protecting a special film, and therefore after many years of operation of aluminum profile will look attractive and will not lose their characteristics. Deciding to use aluminium profile for finishing, you can apply together with him and other materials – glass, plastic, wood, particle Board. The aluminum goes well with them, making designs are durable, aesthetically attractive and durable. Aluminum profiles indispensable in the manufacture of furniture fittings, wardrobes in the mass, is manufactured with aluminum materials. Door frame aluminum profile is silence, warmth and style to your home, and window construction from aluminum has long proved its right to exist. Aluminum profile is very lightweight, so the installation doesn't place any burden on the supporting structures. It is often used in the repair of old buildings, as well as in the creation of temporary structures. Topical aluminium and in the manufacture of furniture, especially for offices, hotels, etc. Aluminum furniture looks stylish, it is durable, strong, can be used in an intensive mode for a long time. The quality of the aluminium profiles do not require proof, because it is time-tested – original aluminum profiles were used only in military industry. The profile used in the furniture industry, produced from bauxite, a mineral origin of the alloy ensures its environmental cleanliness and safety. Interest in the aluminum profile of the various industries just because it is relatively inexpensive to manufacture, quality and reliable material. Yield and performance characteristics allow to produce different designs, both household and industrial use.